I took the day off from the blog yesterday because I had a doctor’s appointment, and it was one of those that required fasting, so when I got home, I had to make an early lunch, and the day got away from me from there. It seems I’m basically healthy, other than needing more vitamin D and needing to lower my LDL cholesterol a bit. It’s not high enough to be a problem or to warrant medication, but lifestyle adjustments are a good idea to keep it from becoming a problem. Which means more exercise and sticking a bit closer to the Mediterranean diet. I’m already pretty close to it. I just don’t eat a lot of fish and probably have more cheese than I should. Mmmm, cheese. And wouldn’t you know, I bought meat and cheese on my way home yesterday, before I got the test results. More exercise is probably my biggest opportunity for change. I’ve been walking a couple of miles every morning, but the rest of my day is quite sedentary. I need some slightly more intense activity, which is a challenge with bad knees. I guess I need to swim more often in the summer, maybe use my jogging trampoline, possibly invest in an exercise bike. Or just make a point of planning dance breaks throughout the day. I don’t think I’m quite at the point of wanting a treadmill desk, though it could be amusing to see me trying not to fall off the treadmill when I’m really caught up in what I’m writing. I barely manage to sit up without falling over when I’m really getting into it. Being coordinated enough to think, type, and walk just isn’t happening. It looks like there are foldable exercise bikes, which might work with my space issues. I could set it up in the living room and bike while watching TV, then fold it up and put it away when I have company or just want to have space in the living room. The real trick would be using it as something other than a clothes rack after the first week or two. I do have a little pedal thing that you put in front of a chair and can pedal like a bike, but it’s a bit flimsy and tends to wander around the floor when I get going, so it’s like pedal a minute, stop to move it back in place, pedal another minute, stop to move it back. So now I guess I should schedule movement into my day along with writing. I haven’t done a recent reading/book report post in a while, but I have a cool one today because it’s about a book that’s releasing today. I got an advance copy and managed to actually read it before it was released, which is rather different for me (I didn’t read my advance copy of A Game of Thrones until after the first season of the TV series). The book is Spinning Silver by Naomi Novik. It’s a standalone (at least, so far) fantasy novel with Russian/Eastern European influences, playing off the Rumpelstiltskin story. Only, in this case, the one who turns things into gold is our heroine, the daughter of a moneylender, who notes that the fairy tale is a story about someone who made a deal and carried out his end of it being cheated. Her father’s not a very good moneylender, since he hates to ask for payment, and therefore everyone in town is cheating him and the family is poor. Fed up with going hungry, his daughter pulls together the account ledgers and starts collecting debts. Then she invests the income and makes a profit, turning the silver coins she collects into gold pieces. At one point, she boasts of her ability to turn silver into gold … and the wrong person hears it, and takes it literally. This story is interwoven with the story of the girl whose father can’t pay his debt to the moneylender, so she’s working it off in service to the moneylender’s family — and finds that this is the best thing to ever happen to her as she finds a family happier than her own. And then there’s the young noblewoman forced to marry the cruel young tsar, who turns out to have something terribly wrong with him that she might be able to do something about. As you may have noticed, I love fairy tale retellings and new stories that feel like old fairy tales, and this is a bit of both. It’s magical and atmospheric, and you can almost imagine someone telling you this story by the fire on a cold winter night. Winter is actually a big part of the story, as the magical folk (very fae-like) have created an eternal winter. That’s one of the things our heroines have to deal with. I imagine this book would be nice to read while snuggled under a blanket with a hot cup of tea or cocoa, but it was also nice to read on a hot early summer day, when the descriptions of snow piling high made me feel a little colder. There’s a touch of romance in a couple of the stories, but very slow build (so just right for me). I wanted to see how it ended but didn’t want it to end. If you read her earlier Uprooted (one of the books that benefited from my Nebula good-luck charm, as she was sitting next to me when she won), this is along those lines, but is an entirely different story, possibly in a different world. So, go find it. I really liked this one. I think I’ve figured out the ending to this book, but it’s going to require going back through the whole thing to set it up properly. It seems that part of my problem that an event I was trying to squeeze in during the ending really belonged at the middle. Once that’s in the right place, everything flows much better. And I didn’t have a good sense of the timeline. Putting the events onto a calendar really helped me see what was going on and figure out the timing and pacing. I should have been doing that all along. Someday, I’ll learn. You’d think I’d have all this figured out by now, but even if I got it all together, there would be something new to learn. So, this week is my buckle down and get to the end of the book week. Hold all my calls and clear my calendar. Then another project has jumped up and told me it needs to be dealt with. Silly demanding characters. But I guess it’s a good sign if my characters are real enough to me that they can demand attention. Today will be a day of plotting because I hit the end of what I know for sure in the book I’m writing, and my rough outline for the rest of the book no longer applies. I think part of the problem is that the outline was so rough. The big, climactic scene was essentially “and then they do something to expose and stop the bad guys.” Now I’m heading toward that scene, when I have to set it up, and I need to get more specific, but the specifics I already have don’t work with the vague plan I had to set up the big scene. I knew I was getting into trouble yesterday when half the scenes I was writing were the characters arguing about what to do next without coming to a conclusion — and then I realized this was because I didn’t know what they were going to do next. I suspect many of these scenes will be cut from the final draft. I call that “plotting on paper,” when the way I figure out what the characters will do is to have the characters discuss what they should do. Once I know what they’ll do, I don’t really need the discussion unless there’s something else going on in the scene. I love the plotting phase at the beginning of a novel when I’m just starting to explore and discover what it’s about. I’m less fond of the plotting phase at the end of the book when I realize that all the stuff I did at the beginning was actually pretty vague and it didn’t flesh out along the way as much as I’d hoped it would. 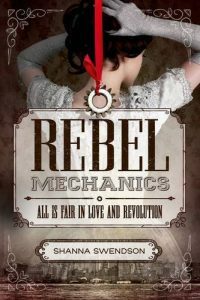 While I’m getting nostalgic about what got me started writing various books, I realized that I started working on Rebel Mechanics around this time eight years ago. I’d been working on the book that became A Fairy Tale, and I was unhappy with it. I had a vision for it and couldn’t quite make that vision work. Meanwhile, I had this other idea that I thought might be more marketable — a steampunk adventure story. I’d been making myself not work on the Shiny New Idea, but thought that maybe what I needed was a break to help me figure out what I needed to do with A Fairy Tale. That summer, I was also dealing with some medical stuff. I had a frozen shoulder, which involves tissue encapsulating the joint so that you can’t move it. It’s tricky because it starts with pain in the shoulder, and the natural impulse is to rest that shoulder so it can heal, but resting is what allows it to freeze. I’d reached a point where I could barely lift my left arm when I finally admitted I needed help, and the prescription was physical therapy. It was tough physical therapy that involved not only exercises but also the therapist stretching and manipulating that arm to loosen the tissue. And there was a lot of pain. It’s hard to be really creative when you’re tired and in that much pain, and since I knew I’d have to do a lot of research to write that steampunk book, I decided to devote the time to doing research. So, that was my summer of heavy-duty reading. I read more than fifty books to research Rebel Mechanics. I read non-fiction books about New York’s history during the Gilded Age, American history, other revolutions, steam power, trains, airships, houses in that era, clothing in that era. I read memoirs of people who lived in that era and biographies of key figures. I also read a lot of related fiction — other steampunk books, science fiction written during that era (H.G. Wells, Jules Verne, Robert Louis Stevenson), novels written during that era or about that era by people who lived in that era. I re-read Jane Eyre (since I was doing the governess thing), read The Scarlet Pimpernel (since that related to Henry’s story), read a lot of Edith Wharton (about Gilded Age society). All the while, I was piling up notes and ideas that I shaped into characters and a plot. It was a summer of wallowing in Victoriana, and I now remember it fondly, in spite of the pain. I did eventually get full use of that shoulder back and regained my strength in that arm. I’m not quite as flexible as I was before, but I’m trying to work on that. It also took me a few years to sell the book. I originally planned for it to be an adult fantasy novel, but the adult publishers weren’t interested, mostly because a lot of them saw it as a romance and even suggested it be sent to the romance houses (never mind that the romance was quite chaste), or else they said they’d already bought a steampunk book. I tried reading some romances that might be along the same lines (multiple books telling the story of the same couple), but I started thinking it would work better as young adult since my characters were so young, so I read a bunch of YA before deciding to rewrite it as YA. That took me another six months or so, and then it took nearly a year to sell. It was five years from the time I started researching it before it was actually published. 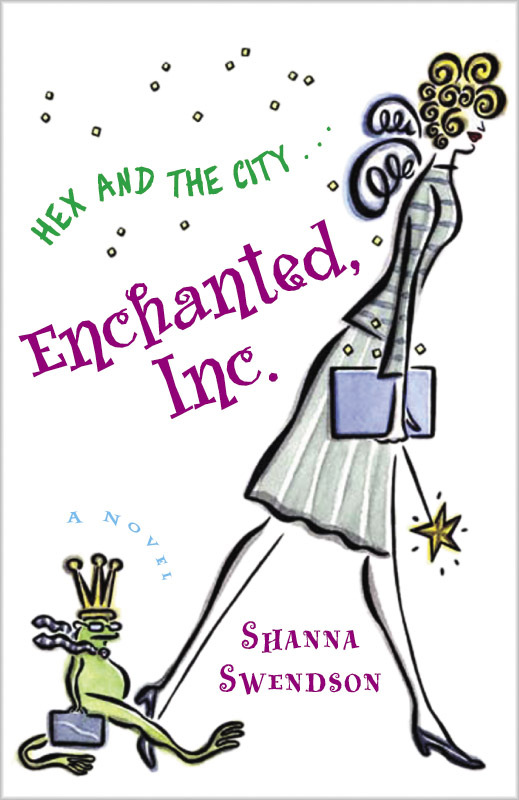 I’d have to look at a calendar to find the exact day, but we’re approaching the 15-year anniversary of when I started actually working on the first Enchanted, Inc. book. I’d had the idea about a year and a half earlier, but I really wasn’t sure what to do with it because there was nothing quite like it in the market. It was “girlier” than most fantasy and was in a contemporary setting, which was quite rare at the time, but it wasn’t really romance. Every so often I’d play with the idea and add to it, but I was focusing on writing other things. Then at some point in July, I was at a conference, and there was a party to launch a new fantasy imprint from Harlequin that was going to be more female-focused. The pre-launch guidelines said they were looking for traditional fantasy, which meant that even if it might be a good fit for the “girly” side of my book, they probably wouldn’t be interested. And that was why I decided to try writing that crazy idea I had. That editor actually ended up rejecting it, but I might not have started writing it if she hadn’t shown interest. I never did really find the right market for it. It ended up being published as “chick lit” because that was what was really hot in the market at the time. It was up between two publishers, one that was going to publish it as chick lit/women’s fiction and a fantasy publisher, but the fantasy publisher couldn’t get the auction bid together. 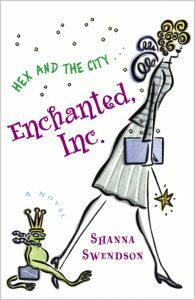 The chick lit market utterly tanked a couple of years later, and the books being promoted as women’s fiction and sometimes paranormal romance meant that fantasy readers didn’t really find them unless they heard word of mouth. I’ve often wondered what would have happened if the other publisher had been able to pull things together, since female-focused urban fantasy became huge not long after that. I’d have been on the leading edge of a trend instead of the trailing edge. But that’s water under the bridge, and that book has done well for me. It’s still selling steadily and most of my income comes from that series. I’m thinking book 9 will be the end, aside from shorter pieces, because nine books is a pretty long series and I’m ready to try other things. But I also love those characters, so you never know. Now that I’ve had some transition time and a weekend, I’m ready to dive back in to book 9. Over the weekend, I read a book with some motivation techniques, so I feel all armed and ready to stay focused and get my work done. We’ll see how long that lasts. Summer isn’t my favorite time of year, which makes it the ideal time of year for me to get a lot of writing done. I can hide in my cave and write while it’s too hot outside to do anything else. My bedroom becomes my office at this time of year because it’s the coolest room in the house. It’s the first vent off the air conditioner, so it’s cooler in that room. There’s only one relatively small window that’s under the shade of the front porch. The ceiling is high, and there’s a ceiling fan. Some adjustment of the bed base, a backrest pillow, and my lap desk, and I’ve got an office. I’ve even considered getting one of those hospital bed table things. I’m also trying to remind myself of things I like about summer. One is fresh fruit. I may turn into a cherry at some point. I love fresh cherries, and at this time of year, they’re cheap. Any other time of year, and they’re ridiculously expensive. I eat cherries with yogurt at breakfast, use cherries as my word count reward while I write, and I’ve made a sort of mock cheesecake with cream cheese, Greek yogurt, some vanilla and a little honey that I use as a topping for cherries for dessert. I also have blueberries and peaches, and I snack on watermelon in the afternoon. And there’s the swimming pool. I keep forgetting about that. We have a community pool that doesn’t get a lot of use during the week, so it’s like having a private pool. On hot afternoons, the water is just the right temperature because it gets morning sun. It’s still cool enough to feel good, but not so cool that it’s shocking. There are trees to the west that block the afternoon sun, so I can swim comfortably without getting a sunburn. I kind of like that it’s in between TV seasons, so there’s nothing much on. That frees up time to catch up on all the stuff that’s streaming, or my DVD collection, or DVDs from the library, or read. There are fireworks at the lake every Friday night during the summer. That’s nice to hit every so often, and it means getting a firework fix without all the crowds of July 4. So, there are a few things to like about summer. Still, if I ever get wealthy, I may become one of those people who “summers” elsewhere, like the mountains, or Alaska, or Maine, or above the Arctic Circle in Norway. I like my community here, so I don’t see myself permanently relocating without some specific reason, but I could imagine spending extended amounts of time in other places.